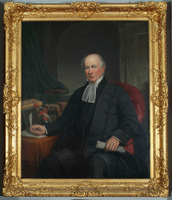 BELCHER, CLEMENT HORTON, publisher and bookseller; b. 5 March 1801 at Cornwallis, N.S., only child of Benjamin Belcher Jr and Sarah Starr; m. 6 June 1826 at Halifax his first cousin, Mary Jane Starr, and they had six daughters and three sons; d. 23 May 1869 at Halifax. Clement Horton Belcher’s grandfather, Benjamin Belcher Sr, one of the earliest settlers of Cornwallis, was a prosperous landowner, trader, and member of the assembly. Belcher’s father died in 1802 and his mother married Walter Carroll Manning of Halifax three years later. Thus Clement was probably brought to the city as a small child and received all his education there. Belcher first served as apprentice to James Hamilton, the proprietor of one of the province’s largest dry goods establishments. His stepsister’s husband, George Eaton, operated Halifax’s only bookstore and on Eaton’s death in October 1822 Belcher, at the age of 21, took over the stock and established himself in the thriving business, which he ran for the next three decades. Late in 1823 he extended his interests to the publication of the The farmer’s almanack, for the year of our Lord 1824 . . . and continued to issue it annually. In 1832 the name was changed to Belcher’s farmer’s almanack. Belcher began his almanac only a year after the appearance of The letters of Agricola . . . , in which John Young* urged the farmers of the province to abandon their traditional methods for a more scientific approach to agriculture, and it is likely that Belcher was influenced by Young’s commonsense theories. After extensive reading in agricultural literature he began to intersperse the pages of the Almanack each year with valuable suggestions and hints on the management and maintenance of a farm. Meticulous and methodical, Belcher made every effort to ensure that his information was reliable. Consequently it was only reluctantly that he permitted the inclusion of weather prognostications, always a popular feature. The Almanack eventually became an almost indispensable tool – a business directory, almanac, and book of reference combined – and Belcher’s name a household word throughout the province. After his death the publication’s goodwill passed to the firm of McAlpine and Barnes, but the Almanack continued under the originator’s name until publication ceased in 1930. Belcher also appears to have been the compiler of the short-lived Nova Scotia temperance almanack, issued annually from 1835 to 1837. His interest in publishing extended to a wide variety of titles, including the second edition of Thomas Chandler Haliburton’s A general description of Nova Scotia . 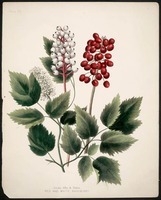 . . (Halifax, 1825) and the first two parts of Maria Frances Ann Morris*’ Wild flowers of Nova Scotia (Halifax and London, 1839–40). Belcher was a man of broad interests, both in business and in private life. When the Western Stage Coach Company was organized in 1828 he was one of the promoters, serving as agent until its disbandment with the coming of the railroad in the 1850s. An ardent flyfisherman, he delighted in casting the streams of the countryside for salmon and trout, deploring the use of live bait as a form of murder. He was a devout Anglican, worshipping at St George’s Church, where he served as senior warden during the incumbency of the Reverend Robert Fitzgerald Uniacke. In later years he devoted much of his time to the militia and at death held the rank of colonel of the 6th Halifax Regiment. 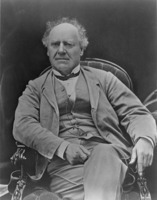 An unabashed tory, “a politician of the old school,” he openly opposed the views of Joseph Howe*, not always to his material advantage. In 1857, through Howe’s influence, the £10 in pay due him as adjutant of the 3rd Halifax Regiment was deliberately withheld, though his brother officers were paid without question. PANS, MG 4, no.18, record of marriages and deaths for Cornwallis Township, 1760–1825; MG 5, Camp Hill Cemetery (Halifax), August 1844–July 1869 (mfm. copy); RG 5, R, letter to J. J. Marshall, 21 March 1859. Halifax Herald, 14 Oct. 1892. Morning Chronicle (Halifax), 24 May 1869. Novascotian, 31 May 1869. The army list of local forces of Nova Scotia . . . (Halifax, 1866). Belcher’s farmer’s almanack, 1824–1930. Directory of N.S. MLAs. A. W. H. Eaton, The history of Kings County, Nova Scotia . . . (Salem, Mass., 1910). Shirley B. Elliott, “BELCHER, CLEMENT HORTON,” in Dictionary of Canadian Biography, vol. 9, University of Toronto/Université Laval, 2003–, accessed April 24, 2019, http://www.biographi.ca/en/bio/belcher_clement_horton_9E.html.